Named for their beautiful home in the mountains of the Hawaiian Islands, Hawaiian Black Sheep possess a beautiful black coloring that makes them a very popular trophy animal. They have horns that grow in a spiral or circular pattern and point out and typically weight about 125-150 pounds. 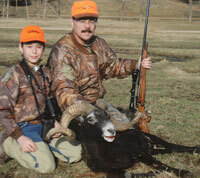 For more information on Hawaiian Black Sheep Hunting at High Adventure Ranch, please call (314) 209-9800 or fill out our contact form.